One block west of I-95 off Hillsboro Blvd in Deerfield Beach. Played Amy's Revenge with two of my friends. We had a fantastic time! I love how we were greeted as "agents" upon entering and during the entire game. We did not escape, however, we had a lot of fun. The set up for the room we were in was awesome, decorations looked nice, place looks clean. After the game, you get to dress up for pictures. 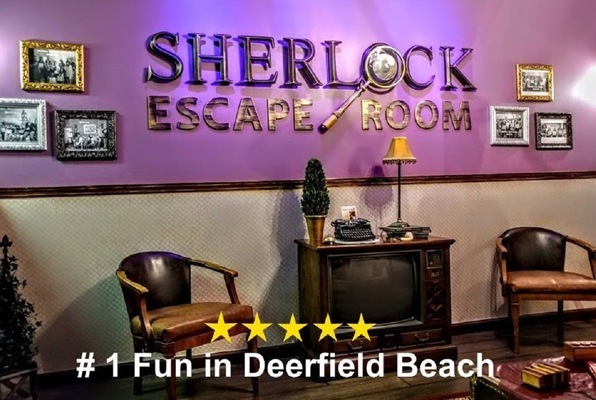 The staff was very friendly, clues came in instantly when asked, and we were walked though the part we didn't solve in time. Amy always seemed to have amnesia but during a previous investigation inside her apartment, she was exposed. Her place was busted by our previous teams of agents. Amy is thought to be involved in a recent gold robbery case. Your team has been tasked with searching her place, uncovering hidden evidence linking her to criminal activity and finding a secret route to escape, all within the next hour. Reviews of escape game "Amy's Revenge"